New items inside your home can sometimes pack an odor that is both unpleasant and nauseatingly strong. Furniture, building materials, flooring, and cabinets when newly installed will all produce this odor that will travel throughout your home and become extremely hard to remove. Similar to that of a new car, the smell is an amalgam of chemicals that create this odor on items inside your home, and formaldehyde is a predominate chemical used within these items. Whereas long-term exposure to formaldehyde can potentially lead to serious conditions such as cancer. Why Do I Keep Smelling Formaldehyde in My Home? Is that formaldehyde smell still lingering throughout your home and even producing a stronger odor than what you initially started with? This strong smell is caused by a process called “off-gassing” that occurs to the chemical. Formaldehyde, when at room temperature, will convert into a gas that will start to expel from the item in your home. When an item begins to give off formaldehyde, it is released into the air and this is classified as off-gassing. 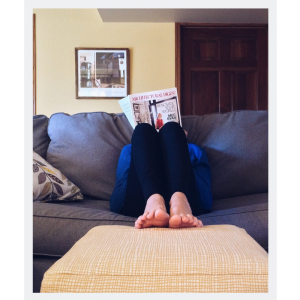 If you begin to experience this inside your home, a good solution may be to remove the source of the formaldehyde like a couch and place it outside to complete the off-gassing process. But, if it is coming from a source that can’t be removed from the house, like flooring, you can try to open windows and doors to flush out the contaminated air from the home, or even use a VOC air purifier that will remove the harmful VOCs from the air. 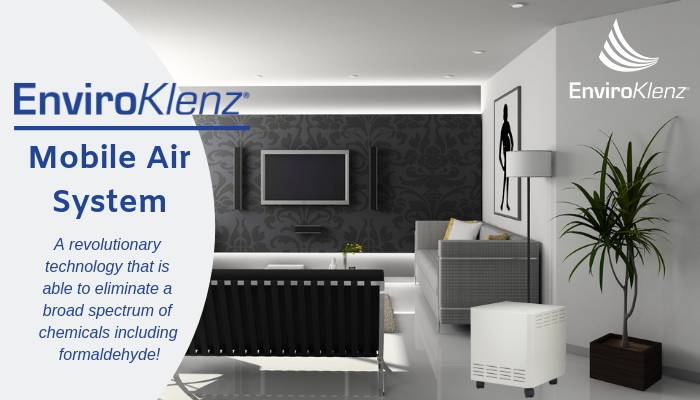 Many air purifiers utilize technology such as carbon, ionizers, or ozone within their systems, and although these may be effective in removing some airborne contaminants, they also possess some harmful effects that can become present in your air. The EnviroKlenz Mobile Air System, however, utilizes a technology all of its own – a patented earth mineral technology that is able to effectively break down and neutralize a broad spectrum of chemical odors, noxious odors, and VOCs from the air. Unlike many of the other technologies, EnviroKlenz is actually able to break down and neutralizes the VOCs and chemical odors without the fear of it being re-released into the environment when the filter becomes full, similar to that of carbon. Or even fear that it is releasing a chemical into the air like ozone and ionizer machines do.